New Era Begins in East Balto. 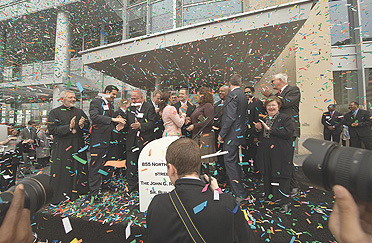 The confetti flies as invited dignitaries celebrate the opening of the first building at the Science + Technology Park at Johns Hopkins. The first building at the Science + Technology Park at Johns Hopkins, a key component of a massive East Baltimore revitalization effort, officially opened its doors on Friday following a dedication ceremony attended by more than 500 people. Mayor Sheila Dixon, Gov. Martin O'Malley and other prominent city, state and federal officials joined with developers and senior Johns Hopkins administrators to dedicate the John G. Rangos Sr. Building, a 278,000-square-foot research facility located at 855 N. Wolfe St., just north of the Johns Hopkins medical campus. The event also honored the vision and philanthropy of the building's namesake, a Pittsburgh businessman, who was honored at the festive event. Johns Hopkins is the anchor tenant and is leasing one-third of the space in the building, which is the new home for the School of Medicine's Institute for Basic Biomedical Sciences. The remaining space will be leased to private biotech companies. Faculty and staff from Johns Hopkins have already begun to move in. The Rangos Building is the first of five state-of-the-art life sciences facilities planned for the project by the Forest City-New East Baltimore Partnership. Sen. Barbara Mikulski said that the day was a momentous and happy one for the community. She recalled the days when she worked as a social worker in the area and spoke of the great opportunity to capitalize on Johns Hopkins' presence in East Baltimore to reinvigorate the tract from the medical campus to North Avenue. The Science + Technology Park at Johns Hopkins, she said, is a vital first step to achieve that goal. "This is the beginning of the new East Baltimore," Mikulski said. "It is a beginning of many other great things to come." Gov. O'Malley similarly called it a joyful day. "What we see in these blocks are not just bricks and mortar. What is happening here is the expression of the soul of a great American city," he said. Stephen Desiderio, director of the Institute for Basic Biomedical Sciences, said that the new facility would marry resources with ideas, and science with industry. "This wonderful new facility is built on the simple idea of collaboration — to bring together the efforts of those with diverse skills and common interests," said Desiderio, a professor of molecular biology and genetics. "It also renews an enduring partnership between the School of Medicine and the community of which it is part." Myron "Mike" Weisfeldt, William Osler Professor of Medicine and physician in chief at The Johns Hopkins Hospital, said in an interview before the dedication that it's very notable to have such a cutting-edge facility dedicated to traditional basic science research. Roughly 200 university investigators will use the space to conduct transitional research on human diseases such as cancer, kidney disease, HIV and hepatitis C.
"To my knowledge, this is the first time Johns Hopkins has put a significant chunk of basic scientists from the clinical departments [together] with true basic scientists who are working on the most recent discoveries," he said. The new building, Weisfeldt said, will spur technology transfer and serve "as a raft" for small companies, spinoffs and industry people who will lease space there. "Industry people and clinicians will literally share the same conference rooms, lunch room and hallways," he said. "They will talk to each other, collaborate. And hopefully this will make for a productive, entrepreneurial environment. This is what really convinced the donor, Mr. Rangos — the might of American industry side by side with the development of practical medical treatments." John G. Rangos Sr., a pioneer of technological advances in the field of waste transportation and disposal, is head of the John G. Rangos Sr. Family Charitable Foundation, an organization that has funded institutions such as the Rangos Research Center and Rangos-Trucco Diabetes Laboratory at Children's Hospital of Pittsburgh and the Rangos School of Health and Sciences at Duquesne University. In support of medical research at Johns Hopkins, the Rangos Foundation has committed $10 million to the Institute for Basic Biomedical Sciences to underwrite its use of the space. In 2003, Rangos established a professorship in the School of Medicine's Division of Gastroenterology. "John Rangos' generosity and commitment to science and the community have ensured the kind of collaborative environment necessary to foster scientific and medical advances," said Edward D. Miller, dean of the School of Medicine and chief executive officer of Johns Hopkins Medicine, before the event. "We are honored by his contributions and pleased that the first building in this new enterprise will carry his name." In addition to Johns Hopkins, BioMarker Strategies, the Howard Hughes Medical Institute and Cangen Biotechnologies have already leased space in the building and plan to take occupancy this spring. The companies will all have access to the use of sophisticated research equipment located on the Johns Hopkins campus. It is anticipated that the companies and businesses in the park will bring 4,000 new jobs to the area. The Science + Technology Park at Johns Hopkins is part of an ambitious mixed-use development program in the area. East Baltimore Development Inc. has spearheaded and manages the $1.8 billion revitalization of the "New East Side," an 88-acre portion of East Baltimore. The first phase of development plans for the area include the 1.1 million-square-foot Science + Technology Park, more than 850 housing units for mixed-income buyers and renters, park space and a variety of retail services. University President William R. Brody said that the Rangos Building is a result of numerous partnerships and great resolve on the part of its champions. "So many people contributed to make this happen, but I want to especially thank John Rangos for his generous gift," Brody said. "John, on behalf of The Johns Hopkins University and everyone in the community, please accept our thanks, gratitude and our most sincere appreciation for your tremendous generosity." The Johns Hopkins School of Medicine has established a formal educational agreement with the University of Patras, the third-largest university in Greece, to collaborate on research and student and faculty exchanges. The two schools began the collaboration officially on Friday, when representatives from the 43- year-old Greek public institution visited Johns Hopkins to sign the agreement, championed by leading Greek-American businessman and philanthropist John G. Rangos Sr., a member of the Johns Hopkins Medicine board of visitors and longtime benefactor of the School of Medicine. Myron L. Weisfeldt, director of the Johns Hopkins Department of Medicine, who facilitated and developed the areas of collaboration, said, "This is a tremendous opportunity for Hopkins to share new ideas with an outstanding institution abroad. We're expecting a fruitful relationship for Hopkins as well as the University of Patras." The agreement specifies six objectives: an exchange of faculty, students and staff; brief visits of teaching, scientific and research staff related to specific studies and lectures; development of undergraduate and postgraduate student training; administrative staff exchanges geared to evaluation and improvement of curriculum; initiation of joint research programs in areas of mutual interest; and cooperation in cultural and athletic events. The representatives from the University of Patras signed the collaborative agreement on the day the John G. Rangos Sr. Building was dedicated in East Baltimore (see story, "New era begins in East Balto., in this issue.). The visiting delegation was led by Dimitrios Dougenis, vice director for academic affairs and personnel and professor of cardiothoracic surgery. The University of Patras is located in the northwestern part of the Peloponnesus, in close proximity to the ancient sites of Olympia, Delphi and Mycenae. GO TO APRIL 14, 2008 TABLE OF CONTENTS.